Many thousands of construction workers and other workers in risky jobs like window cleaners, are walking around with unsafe safety helmets on their heads, oblivious to the fact that their helmets are not protecting them! 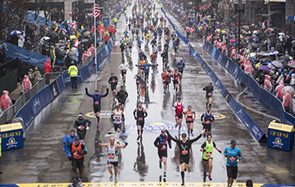 Three Chinese runners, one of whom gave the bib number to other people and the other two forged their qualification certificates for the 2019 Boston Marathon, were banned for life by the country's governing body of the sport from competing in any road running race in China. Experts funded by Britain's Arts and Humanities Research Council have found the remains of Britain's earliest rabbit – a discovery which reveals bunnies arrived in the country 1,000 years earlier than previously thought, the council announced Thursday. The European Parliament approved the proposal to reform the rules on Schengen Visas on April 17. The adoption of new regulations will simplify the procedures of the visa application. The China-US trade war may help promote the internationalization of the yuan as the Chinese currency seeks a global footprint, analysts said on Tuesday. The annual survey Amazing China – the Most Attractive Chinese Cities for Expats 2018 unveiled its results at the Shenzhen forum of the Conference on International Exchange of Professionals on April 14 in Shenzhen, South China's Guangdong Province.